What lengths would you go to, to save the ones you love? That was the challenge Jack accepted, over and over again, in Opposite of Always, and the results were always the same for me - laughter and tears. This book had SO many strengths! I am just going to pinpoint some of my favorite things. Reynolds created a full cast of multidimensional characters, who I loved. Both Jack and Kate were stupendous, and I grew to care for them deeply, but he also gave us Jack's parents, and his best friends, Franny and Jillian too. Each of these characters were wonderful and integral to my enjoyment of this story. The time loop was done so well. These Groundhog Day style books seem to be popping up a lot lately, but this has been one of the most successful for me since I read Before I Fall. Reynolds used the time loop judiciously, and didn't allow the story to become repetitive. It never dragged or got old for me, and I kept looking forward to the seeing what adjustments he would make. I also loved the chapter entitled, "What Would Bill Murray Do?". Nice. Kate's illness was treated quite thoughtfully. I appreciated the genetic disease that was selected for her, because it's one you don't hear about enough. I also liked that she didn't suddenly become ill, but rather she had been dealing with it her whole life. It brought a different sort of feel to the story and point of view from Kate, then a sudden illness would. Can we just talk about my emotions? I was crying, I was laughing, I was "craughing" (crying + laughing). It was quite a roller coaster, and because we were in a time loop, I was forced to relive a lot of painful things over and over again. BUT, I also had the pleasure of watching Jack and Kate fall in love over and over again, and that made it worth each and every tear. Reynolds expertly navigated all the relationships in this book. Those between Jack and his parents, between Jack and his best friends, and between Jack and Kate were all done brilliantly. The love, the affection, the emotions were all communicated beautifully. Given this stellar debut, I am looking forward reading more from Justin A. Reynolds. He gifted me with a lovely story about love, family, friendship, second chances, learning from your mistakes, as well as living in the moment, and it was perfection. You know what I love? 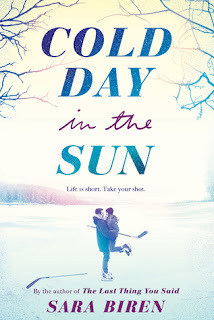 I love when I cannot stop smiling while reading a book, and that was EXACTLY what happened to me as I read Cold Day in the Sun. Holland had spent her whole life as one of the boys, and when it came time to try out for her high school's hockey team, she opted to stick with the boys' team, since they already had a well established dynamic in place. Needless to say, she was constantly dealing with naysayers and those, outside of the team, who believed she didn't belong playing with the guys. She had to constantly prove herself, because she felt like they were all just waiting for her to fail. Suddenly, she seemed to be noticing, that her team captain, Wes, has been noticing her, and Holland was forced to mediate a battle between her head and her heart. I love sports romances, and this one featured so many amazing components, which sum totaled to an incredible reading experience for me. Holland was such an easy character to root for. She was driven and focused, and had to wear some armor being the lone woman on a men's team, but she was also sensitive to other people's needs and had a vulnerability, which she was hesitant to reveal, but was still authentic. I empathized with her feeling some pressure and the weight of all eyes always being on her, and it pained me that these people made her doubt herself, but she was so lucky to have such wonderful friends and family. They believed in her and supported her. They gave her that little lift, when she needed it, and it all really warmed my heart. Wes made me smile, A LOT. My initial impression of him was the same as Holland's - not great, but I started seeing these bits and pieces of him, which made my love for him grow exponentially. He was a good captain, who deftly walked that line between tough and encouraging. He was a fantastic brother, who doted on his little sister. He was a good friend, who listened when you needed him to, and he made an effort to see things from your point of view. It was really all the little things he did, which won my heart, and made me believe that he was perfect for Holland. And, OH, what a sweet and lovely romance these two had. I had so much fun spending time with them, and kept hoping Holland would give in to her feelings. Seriously, the tension between these two was palpable, and their interactions ranged from too adorable to swoony. The date at the a-frame, the popcorn, the sharing of hot sauce, the fence, those phone conversations, and even the blog interactions just made me ship them more. Yeah, I was totally onboard with these two. I wish I had photographic evidence of myself reading this book, because I wore an expression of genuine bliss, and another testament to the happy-inducing power of this book, is the grin I am sporting as I write this review. Overall: Cold Day in the Sun delivered that feel-good vibe I expect from sports books, but I also got an adorable romance, a strong and determined heroine, a swoony hero, and a wonderful and supportive family. Go Figure was mentioned in this book. It is one of my daughter's favorite DCOMs, but Hockey Night is the penultimate girl playing on a boys' hockey team movie for me. And, yes, that is Megan Follows. **ARCs received in exchange for honest reviews. I loved that book so much. I was shocked at how fast I read it too, but I could not bring myself to stop, because I was enjoying it so immensely. Opposite of Always sounds perfect! I ordered my very first subscription box this month and that's the book in it so now I'm even more excited to read it. I hope you like it. I can't wait to see what you think. The Reynolds book sounds so good! I think I need to request it from the library. Sounds like the author handles the story really well. I am really excited about him. I don't read that many male writers, but Reynolds and Philippe have both impressed me with their debuts. I love hockey. I played my flute in the pep band in college just to watch the hockey games for free. My town was a football town, and I joined color guard so I could see the out of town games. sound like a couple of good ones. thanks for sharing. I loved Before I Fall, so Opposite of Always sounds like one I would enjoy! Those two books just did the time loop so well, in my opinion, and Opposite was funny and touching to boot. These both sound wonderful and I'm happy you enjoyed them so much. I've come across some other positive reviews for these too. I already knew I would enjoy Biren's book, because I liked her debut, but Reynolds blew my expectations out of the water. I have read books where parts of the time loop went well and other didn't, but Reynolds just did it 100% right for me. YA authors always find the interesting names for their characters. I think it's a requirement. It was cute though, because the love interest nicknamed her Dutch and when he explained why, I couldn't help by "awwww". Can we get Justin Reynolds to hurry up with his next book, because I definitely want to read more of his work. So good. The other one sounds good too. I am not really a hockey fan per se, but I DID love The Mighty Ducks movies, like a LOT. I am still waiting for the reboot tbh haha. Glad these were both so good for you! I have nothing but good things to say about Reynolds' book. I think he did a thing at Books of Wonder, but those events are always during the week, and I could never make them unless I didn't go to work. It's also far from Penn Station, which makes it unattractive to me. I hope you have a lot of fun at your book events!!! I almost did a list of Girls in Hockey movies, because there are quite a few great ones out there, and the Mighty Ducks would have definitely made my list. Okay, showing my ignorance here, but... what is DCOM?? I think you had to have a kid in the early 2000s to get that reference. I don't even know if they have DCOMs anymore, and I would probably would get lost with new mom lingo. Both of these sound great! A time loop...that has me. I will have to pick these up. And did you hear about the adaptation?! I hope it does this book justice. 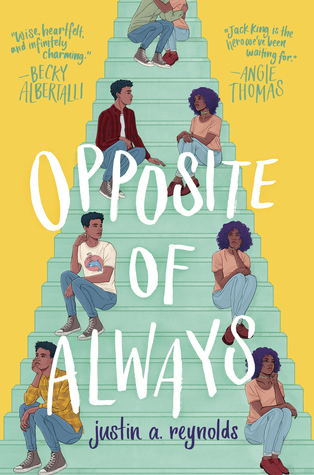 I've not really seen Opposite of Always about so didn't know anything before your review but I do love a good Groundhog Day style book and it sounds like a wonderful emotional read. I mean, when you said Kate died I was picturing a Before I Fall type situation but the fact it's an illnes makes it so much more interesting. 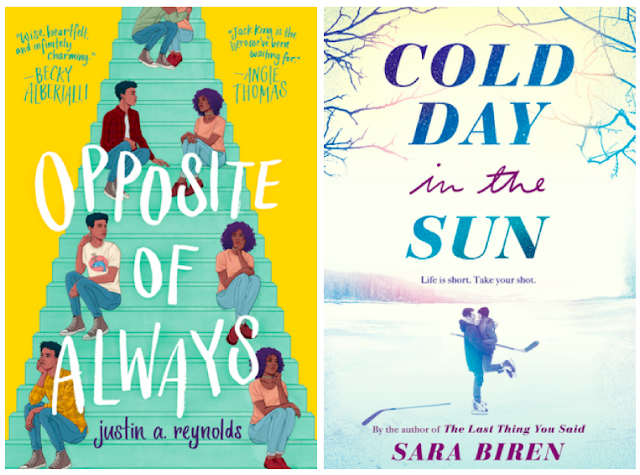 And I've only just heard of Cold Day in The Sun but it's too pricey for me to buy right now but your review makes me so glad I have it on my radar. It just sounds exactly like the kind of book I'll enjoy. I'll just have to patiently wait for the price to drop. Boo for expensive books! Because, Biren does YA contemporary so well, and this one had a lot of heart and soul and fun and swoon. It made me feel good.